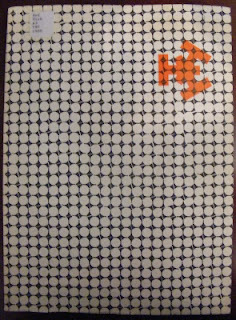 The Society of Typographic Designers of Canada's (TDC's) Typography annuals, or exhibition catalogues, were produced between 1958 and 1964 to highlight commendable Canadian typographic design. Initially Anglophone-dominated and Toronto-centric, the competition gradually became more national and bilingual in character as the years progressed. However, in addition to celebrating and encouraging examples of good design, the competition also served to further define typographic design as a profession. As is explained through the writings of the various catalogues, the competitions, like the TDC, served to foster a national design community and legitimize its members as participants in a field which was specialized and separated from the related professions of publishing and printing. Typography 58 beings with an insert to contributors to the TDC's competition, explaining that by participating in the competition they are contributing to an “important field.” This supplementary document reflects an attitude which is found throughout the written contributions to the catalogue, where the writers take the position that the competition, like the TDC itself, is helping to establish typographic design as a distinct field from printing or advertising. While related to, and closely connected to, these fields, they argue that typographic design (which would eventually come to be referred to by the TDC and graphic design in the late 1960s) is not so much concerned with the technical production of prints or the advertisement of products, but the communication of ideas through graphic representation. In the introduction to the catalogue, the co-directors of the competition, Frank Davies of the TDC and Leo H. ??? [not clear from signature] of Rolland Paper (sponsor of the competition) argue that the purpose of Typography 58 is to expose the public, publishers, printers, and designers to the best designed printed material of the year in an effort to encourage members of the industry to meet and exceed those standards of excellence. They argue that other related fields had already begun holding similar competitions. In particular they mention the Canadian Industrial Design Council and the Art Directors’ Clubs of Toronto, Montreal, and Vancouver, which had published annual collections of the best advertising and editorial art of the year. While including both publishers and printers in the audience and participants of this competition, the directors also claim that, “… no matter how great the technical advances or editorial skills, the quality of the actual presentation still rests with the individual designer and craftsman.” This statement appears to exclude the technical expertise of printers or the editorial ideas and decisions of publishers, presenting the typographic designer (or graphic designer) as the one who is ultimately responsible for the success of a publication in communicating particular ideas. The 1958 catalogue is divided into three sections: book design, business printing design, and magazine design. The book design section begins with the instructions that were given to the jury, which was composed of Gerry Moses, Paul Arthur, and Eric Aldwinckle. These instructions assert that the jury members should select works which they believe should be emulated by other designers, publishers, and printers. Importantly, the instructions specify that, while the judges should be primarily interested in book design, they should disqualify entries which are of substandard print production. Works with poor, “typesetting; make-up; engraving; press-work, casemaking, binding or other production operations; art – illustrations (including photographs) which are sufficiently badly executed to noticeably mar the appearance or function of the book” were to be excluded from consideration. In the comments by the judges, Moses, Arthur, and Aldwinckle claim that, based upon many of the entries, there, unfortunately, existed a great deal of poor book production in Canada in the late 1950s. Many of the books they examined for the competition were found to be poorly designed, poorly printed, and/or poorly bound. In the case of design, they argue that, “[f]rom this survey one gathers that books ‘happen’ more often than they are designed”. They claim that as long as more care is not taken with how a book looks from front to back, as well as how it is produced, they cannot expect the industry to produce praiseworthy material. Thus, they call for more direction and coordination from the book industry. In the case of design, the judges argued that much of the industry’s difficulties could be overcome if publishers would allow their book designers to have full access to, and guide, all of the departments involved in the production of all of the elements of the book. If they did not, the end result was likely sub-standard work. This, they claim was evidenced by the large number of works of inferior poor typography, inadequate design, and poor paper. In contrast to the book design section, the judges of the business printing design competition felt that the majority of the catalogues, brochures, broadsides, annual reports, letterheads, folders, and other promotional material which was submitted to their competition were effectively designed and well produced. This difference may not simply be explained by the jury being composed of different judges (Stan Engel and Clair Stewart), but by the material being judged. As the judges point out, companies are judged by the look, feel, and readability of their promotional material. Many companies are very cognizant of those elements, and thus, they pay more attention to the quality of their promotional material than, say, a book publisher, who can be preoccupied with considering the written content of the text being published, not the presentation of that content. The judges of the magazine design competition (Keith Scott and David Feist) were instructed to award prizes only to works which they believed that the Canadian publishing community should emulate. Rating material according to the competence of the design, its originality, typography (“has attention been paid to spacing and other niceties”), and the production quality of the final product, they found that many of the entries were of poor quality. Many of the publications suffered from poor typesetting. This often harmed what was otherwise acceptable publication design. However, in the case of consumer magazines, the judges claimed their publishers must have believed that typographic design is simply the use of type in a clever of gimmicky way. Like the book jury, the magazine judges suggest that the poor quality of magazine design entries could have been the result of designers having limited ability to oversee the production process, resulting in products which did not conform to what had been originally envisioned. The catalogue ends with a section about the TDC, likely written by its president, Leslie Smart. Here it is explained that the TDC was created in 1956 to fulfill the need of Canadian designers of books, magazines, and general print material to pool their experience, to learn from, and collaborate with others in their field. The TDC aimed to encourage design talents and improve design standards through the organization of exhibitions, talks, meetings, and the showing of films. The most striking difference between Typography 59 and the annual of the year before is that the 1959 publication is presented in not simply English, but also French and German. This appears to have been an attempt to include both the French Canadian graphic design community as well as German-speaking designers within or outside the country who either participated in the competition or could be enticed to read about it. The annual begins with a general opening statement about the TDC and the competition. The statement starts by recognizing the enthusiasm with which typographic design had been described that year by the Globe and Mail art critic, Pearl McCarthy, who had called it the “…liveliest art in Canada today.” This statement is interpreted as a positive sign for the profession which is described as traditionally only playing a secondary role to other elements of the publishing and printing industries, and never considered an art in its own right. Typography 59 is thus presented as further evidence to support Pearl McCarthy’s statement, proving that typographic design did indeed constitute a legitimate profession and art form. 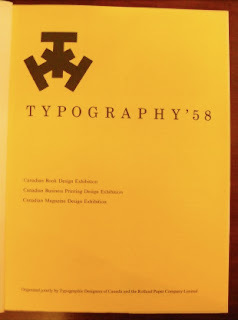 Unlike Typography 58, Typography 59 does not have introductory statements by the judges of its three competition sections: book design, business printing design, and magazine design. Instead, a single essay by Allan Fleming is included at the end of the catalogue. Examining the state and approach of typographic design education in Canada in the late 1950s, Fleming argues that, in addition to exciting students in the possibilities of manipulating typeface and how it is presented, typographic design programs need to familiarize students with each step in the design and printing process. It is not enough to teach students how to make affective layouts. 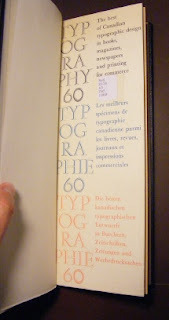 This argument builds upon the comments made in the book and magazine design introductory sections of Typography 58, which criticized many of the poor entries of that year as having been the result of designers not having sufficient oversight of, influence upon, or possibly knowledge of, the entire publication/printing process. While designs may have been well intentioned, their execution did not do them justice and resulted in inferior products. Fleming attributes part of the failure of the existing training programs to take this approach is that, unlike in other countries, typographic design in Canada is often viewed, not a unique profession, but just a form of commercial art. This only encourages they only perform a limited role in the printing and publication process. Furthermore, Fleming notes that the craftsmen who carry out the other tasks in publication and print production (printers, typesetters, etc.) appear to receive less design training than they had in the past. He believes that the solution is that the typographic industry needs to subsidize the schooling of typographers, supplying equipment and expertise, possibly to the point of establishing a Canadian printing school. This would, he believes, produce graduates who would be able to function in the industrial printing and publication field in a manner that would ensure that the ideas of their well made layouts are realized to their satisfaction. It would, he believes, benefit clients, the reputation of one's typographic colleagues, and allow printers to take pride in producing celebrated works. Interestingly, at the end of his article, Fleming states that he considers typographic design to be a "craft" or a "trade." He does not believe it to be an art form. He acknowledges the role that contemporary art styles have influenced typographic design, but he stresses that it is an applied field. It does not strive to create new means of communication, but to incorporate useful, preexisting tools of art to enhance communication through the use and arrangement of type. He concludes by stating that, "[c]ertainly no student should be deprived of the opportunity to experiment, quite the contrary, but the problems of an all-type letterhead or a one-colour business card must never be ignored." The 1959 catalogue concludes with a statement about the history and purpose of the TDC. It asserts that the organization was established with three goals: "to build up a professional status by accepting professional responsibilities; ... to encourage printers, publishers and others to help them in their efforts towards higher standards in printed communication; and ... to increase public awareness of the benefits which we all derive from good design and craftsmanship." Thus, in addition to furthering public interest in design and the execution of quality design, TDC was created to differentiate, legitimize, and strengthen the Canadian graphic design community. Furthermore, the statement claims that, as of 1959, the majority of Canada's professional typographic designers were members of the TDC. 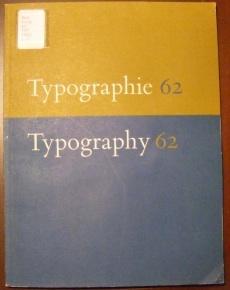 Like Typography 59, the annual of 1960 was published in English, French and German. However, like the publication of two years before, Typography 60 includes introductory statements for its book, magazine and newspaper design, and commercial design sections. The first of these is a report by Frank Newfeld which is printed opposite the book design entries. Newfeld claims that in Canada there are three types of books: those that are designed by editors, those that are designed by printers, and those which are designed by typographic designers. In the case of printer-designed books, he claims that few Canadian printers have the design skills to create works which make effective use of type and layout so as to enhance the book's contents. Instead, in 1960 Canadian printing houses were largely interested and skilled in producing books and not designing them. Printers did not explore new kinds of typefaces, but only used what they had in stock, often understanding all typefaces as just neutral vehicles which transmit the words. In the case of editor-designed books, he argues that such productions are often imitations of other works. This imitation does not take into account the unique elements of the book being produced, and thus, results in a design which is ill fitted to the book. Finally, and not surprisingly, Newfeld claims that the designer-designed book often produces the best and most suitable product, but he notes that a number of the submissions to Typography 60 show that the field of typographic design was still experiencing growing pains and quality control problems. In commenting on the evaluation process, Newfeld explains that the submissions were judged according to text preliminary and concluding material; over-all deign; originality; printing; book casing; and the dust jacket. Of those submitted, he comments that many presented a confused selection of styles. This included the poor mixture of typefaces which did not make good combinations, a problem which he suggest could have been the result of a printer having an insufficient selection of typefaces to choose from. (page 5) What is more, those books which attempted to distinguish themselves by using "startling devices", such as very unique typefaces or typesetting, were typically disqualified from competition since their design took away from the audience's ability to consume and understand their contents. (page 7) Like Typography 58 Newfeld complains of the quality of the printing and casing of many of the submissions. In addition, he complains that many Canadian publishing houses suffer in their type and cover designs in that they appear to use a consistent "house look" which gives books on very different subjects a similar appearance. In addition to offering comments on several of the award winning entries (including books designs by Fleming, Arthur, and Smart), Newfeld notes that none of the entries demonstrate any new stylistic trends or revelations in design, although they do give encouraging evidence that some publishers are taking an increased interest in the appearance of their products. The report concerning the magazine and newspaper design competition, written by Keith Scott, claims that the consumer magazine entries for the year were disappointing in that many offered standardized formats for their various additions, an approach which fails to tailor the type and layout to the content of specific issues or stories. While submissions often contained illustrations that complimented the content, the type and layout were often uninventive and standardized. Scott attributes these failures to both rushed production and misplaced newspaper production techniques. Indeed, he suggests that those entries which did meet the competition's criteria must have been produced with great difficulty by the designers. In the case of company magazines, while Scott notes that there were a number of entries which were not professionally designed and made frequent use of "gimmicks," he also acknowledges the numerous entries which contained good design. Business magazines, however, were largely lacking in quality design, a fact which Scott found curious given the influence and role they play in the business world. He also finds it unfortunate, since good typographical design in such publications could act to increase interest in and respect for good design in the business world in general. While praising the number of entries that were submitted for the newspaper category and thus the seeming interest from newspapers in graphic design, Scott notes that few showed any evidence of the application of such design. Many of the entries used a wide array, and poor combinations, of typefaces, and crowded material in a way which gave the impression that little thought was given to presentation. Scott argues that, even though newspapers must be produced in limited time, the same rules of unity, coherence, and emphasis in design still apply. Suggestions he makes to improve this situation include trying to use a limited number of good typefaces more effectively, and giving more consideration to how stories are placed and arranged. The commercial printing competition report was written by Jack Birdsall and notes that, while many of the entries of 1960 were of a fairly high level of design quality, there were both few works of brilliance or highly disappointing entries. While middling, he does argue that such a representation shows a certain level of maturity for the Canadian design profession. The three competitions sections are followed by brief biographies of Newfeld, Scott, and Birdsall, as well as by an essay by Frank Davies, "Why all this fuss about typographic design?" As the title of the essay suggests, Davies' focus is the perceived increased interest in the selection and arrangement of typefaces in a country which is not a centre of type design, book publishing, or the graphic arts. One of the reasons he gives for this increased interest is the establishment of the TDC in order to increase the professional status of the field at a time when there was a simultaneous increased interest in international trends of the graphic arts and typographic design. Davies argues that it is not surprising that Canada would have been affected by international trends in graphic design. He notes that before the Second World War there were sporadic and tempered international influences upon the nation's graphic arts community. Referring to the field as "graphic design" (page 51), Davies explains that such influence typically amounted to the occasional arrival of new immigrant designers who brought the design techniques and traditions of his country of origin. There was some interest from within the Canadian design community in developing the craft of printing and looking to other countries for guidance, but this was limited. In addition, the only real contribution Canada made to the international graphic design community was Carl Dair's book on the basics of typographic design. Yet, since the war, the immigration of designers who had been taught in Germany, Hungary, and other countries greatly increased the exposure of Canadian-born typographic designers to the styles and approaches of other countries. The increased international communication which was facilitated both by such new arrivals, changes in communications technology, as well as the internationalization of trade and culture. Furthermore, since the war several native-born designers had undertaken training and worked in other countries, in addition to being influenced by developments in the United States. Allan Fleming had trained and worked in Britain and the United States, while Paul Arthur worked at Graphis in Switzerland. However, the increase in international influences does not explain the growth in interest in typographic design all around the world. Designers in various countries are suddenly interested in typography. Davies suggests that this development could be explained by the "onslaught" of photographers in the design field, with designers retreating to the realm of "copy." Yet, he also notes that in many cases designers are not so much interested in creating clear and legible type than using typefaces as shapes which can be arranged to create patterns, symbols, or illustrations. In the pre-war period design was guided by Tschichold's New Typography. Following 1945 the Dutch designer, Sandberg's, Experimenta Typographie guided the development of the typographic organic phase which had lasted from the war up to the time Davis war writing. He claims that in both cases there was a move away from typographers merely selecting fonts which matched the "flavour" of the subject matter. Sandberg, however, showed typographers how to use text in a manner which would have it mean more than the words themselves. "He did this by choosing type with profound sensitivity and juggling the letterforms and their positions freely to symbolize the theme. The new approach is, at its purist, a form of poetry." (page 55) Davis believes that this approach recreates a link with lost elements of human communication. Text is typically monotone and non-expressive, with the author having to communicate all meaning through the words chosen. While there have been other writers and examples which have made a similar point, Sandberg's text offered the most clear-cut example, with the resulting approach being what Davies terms "Typo-Graphics." However, Davies also notes that the visual punning involved in the double meaning of such "Typo-Graphics" required the attention of the audience, its effect is not always instantaneous, and can often involve particular cultural knowledge. A problem to the growing internationalization of typographic design, according to Davies, is that access to the solutions from around the world can lead to a lack of originality. The public and typography design students appear, according to Davies, to be confused about what makes good typographic design. It is not the use of popular gimmicks or tricks, but the "logical approach and creative intuition behind communication... Unhappily most of them cannot see beyond the outside styles and in their hands there is danger than communication could disappear entirely behind clever personalisms." (page 57-8) Davies claims that "graphic design" (page 58) is one of the most important mass-communication mediums, but students of the field in Canada are largely denied training at proper graphic arts schools. Rather, most students of graphic design in Canada's publishing field, the fourth largest manufacturing industry in Toronto, must be self-taught in the art of design. Thus, like Fleming in Typography 59, Davies calls for proper training in typographic design. He claims that whether Canada will increasingly produce good design and designers will hopefully be influenced by the large number of international designers working and inspiring others within Canada. These designers bring ideas from around the world and will enrich the work of the country's typographic design community. Davies' call for better typographic design education is echoed in introduction to the section concerning the competition between student entries. First introduced in Typography 60, this report praises the experimental elements of the entries from Quebec and British Columbia, as well as the latter's "soundness of approach," and admits that many of the student entries reflect the influence of particular teachers, it also condemns many of the entries from Ontario as showing little evidence of formal training in the field. The judges claim that many of the student entries were rather uninventive in that they used similar solutions to different problems. In addition, they argue that most show a lack of practical training, asserting that provincial graphic arts schools are needed, and suggesting that the printing industry should do something to improve such training, possibly by providing materials or instructors. Interestingly, the report on the student entries competition, like Davies’s essay, are only printed in English. Typography 61 begins with the TDC president's (William Toye) message, in which he claims that that year's annual represents the TDC membership's search for a typographic utopia of good design. Covering June 1960 to June 1961, the bilingual exhibition catalogue again highlights the best design from the year, not only to honour those who have achieved high standards in design, but to inspire others to develop similar effective means of delivering specific messages to an audience through type and associated imagery. Significantly, Toye claims that typography is not an art, but a craft, and one which "cannot fail to interest us all because it affects us all." (page 1) This later claim reasserts the claim made by Donnelly that, following the Second World War, design came to occupy an increasingly important place in an increasingly consumer-oriented society. Following the president's message, the catalogue departs from the format/content of the previous three editions by including an essay by a non-Canadian designer. "Where are we going?" was written by the American designer Aaron Burns, President and Director of Design of Graphic Arts Typographers (New York) and Director of the International Center for Typographic Arts. He interestingly begins by defining typographic design, suggesting that still, in 1961, all of those doing typographic design were still not completely sure as to the limits of the field. He defines the profession by borrowing from a definition given by the "noted semanticist" Anatol Rapaport, who stated at the first World Seminar on typographic Design in 1958 that "Typography is to printing as elocution and dramatics are to the spoken word." (page 8) From this Burns argues that typography should be understood as being an "attitude or a conduct of thought" and printing or typesetting as "an application of defined working principles." (page 8) From this, Burns stresses that it is important that, as professionals who are attempting to communicate specific ideas through visual design, designers communicate and share ideas on an international level, and that designers strive to more accurately understand how individuals, including people from different cultures, think and why they react in particular ways. He claims that his International Center for Typographic Arts would act as an appropriate clearing house for international typographic communication and the exchange of approaches and ideas. Burns concludes his comments by stating that he was exciting to discover the "high level" of design being produced in Canadian centres such as Vancouver, Toronto, and Montreal, all of which were apparently design communities with which he was largely unfamiliar before being asked to comment on the exhibition. The first section of the exhibition, book design, is introduced by Frank Davies who writes that the entries for Typography 61 were markedly better than those from previous years, noting that, "even the mediocre books are better and the bad books look worse and worse by contrast." (page 13) Davies then continues by giving a brief overview of the quality of the designs from previous years, explaining that in 1958 many book designs suffered from both poor design, as well poor printing and binding. While the binding and printing did improve since then, the book design had benefitted from a growing design "maturity" and the removal of "gimmicks." Unlike the books of earlier competitions, many of those in the 1961 competition had been carefully designed from dust jacket to index. However, as Davies notes, despite the growing general competence in book design, the jury easily selected Frank Newfeld's design of Leonard Cohen's The Spice Box of the Earth as the best designed and produced book of the year. The introduction to the "Magazine and Newspaper Design" section is written by Carl Dair, who laments that many of the submissions were either "dull and correct" or had some elements of exciting design, but also showed considerable inattention to detail. Although he does claim that some good work was being done in Canadian magazine and newspaper design, much of that good work was not submitted to the competition. He concludes by hoping that such good design will be submitted for the 1962 competition. The new section on "Experimental Design" is introduced by Harold Kurshenska, who argues that many of the entries which were submitted as "experimental" was actually quite disappointing. The most interesting and groundbreaking work was often the work of students, while many seasoned designers appeared to submit layouts which had been rejected by clients whom the designers appeared to believe were misguided. Kurshenska suggests that many of these professional designers should take the time to experiment on their own, claiming that their design skills could become stayed and mediocre if they only produce "acceptable" work for clients. The final section of the catalogue, that of "Student Entries," is also introduced by Carl Dair. He notes that entries from the students at the Vancouver School of Art were surprisingly good and that their work and the guidance of their instructor, Robert Reid, should be viewed as a model for other design programs across the country. Unsurprisingly, Dair, who was often concerned with designers' understanding of both the theoretical and technical elements of both design and printing, particularly lauds the Vancouver students for their knowledge and understanding of the practical considerations of printing. Typography 62, covering June 1961 to June 1962, begins with an informal introduction by Frank Davies which defines the role of the typographic designer. As with the beginning of Typography 61, this apparent need to define what typographers do suggests that the profession was still in the process of defining itself. Davies emphasizing the place of type in the designer's work, claims that good typographic design is not noticeable, but does enhance the message of printed material. Through the choice of letterform, the length of lines, the size of type, and the spacing between words and characters the typographic designer controls the rhythm of reading. However, all such choices are only beneficial if the reader is unaware of them. He likens failure in design to a "ham actor" who, in struggling to impress, destroys the illusion of acting. As with Typography 61, the main introduction to the 1962 annual is written by an American (actually a Dutch-American) designer, Pieter Brattinga, Professor of Art and Chair of the Department of Advertising Design and Visual Communication at the Pratt Institute in New York, and Director of Design at the Dutch printing firm, Steendrukkerij de Jong & Co. Brattinga begins "An Appreciation" by warning that, while useful for celebrating good work in design and showing colleagues what creative solutions have been advanced for various communication problems, annuals, such as Typography 62, should only be used to inspire designers. They should not be sources from which designers copy the latest design trends. This, he believes, would quickly drain the field of creativity and would lead to homogenization, and he likens such practice to the work of "commercial artists" and those wishing to make a "fast buck.". Thus, he praises the TDC for including a student design section in its annuals, so as to both encourage good design amongst new designers, and discourage the blind use of popular styles or gimmicks. Significantly, in briefly commenting on particular designs in the exhibition, Brattinga, in contrast to commentators in other editions of Typography, praised the use of "pure Swiss typographic design." He even criticized a design firm which had produced good Swiss inspired design for not employing such well-regulated design styles in all of their corporate designs, claiming that corporate identity should not have a "relaxed outlook." In commenting on the various sections of the competition, Brattinga, like commentators in previous years, was disappointed by the apparent lack of good design for Canadian newspapers and magazines. In the case of books, he lamented that many are not well designed from cover to cover, but only have well designed covers and introductory sections, giving the impression that the designer, the printer, and the reader should not care about the appearance of the portion of the book with which the reader is going to spend the most of his or her time. Brattinga concludes his introduction by noting that, while his review of all of the entries in the 1962 competition showed him the high quality of design appearing in Canada, he was unable to distinguish a truly Canadian style of design. Rather, he recognized that Canadian designers were being increasingly influenced by many international influences. However, he does not appear to believe that this diversity of influences is necessarily beneficial, suggesting that it could lead to the copying of those foreign approaches and not allow for the development of original Canadian design styles. Thus, he emphasizes that Canadian design programs have to encourage the development of regional Canadian styles which would highlight unique regional solutions or approaches to various design problems. In their judges' report for the "Book Design" section, William Toye, John Gibson, and Harold Kurschenska explained that while there was only a small number of books which were so ugly they had to be rejected out of hand, the majority were wanting in at least some aspect of their design. As was mentioned by Brattinga, many of the submitted books had well designed elements, but few were well designed from cover to cover. And while the judges do praise a few of the book designs for 1962, including Frank Newfeld's design of The Canadian Dictionary, they note that there were none which were extraordinarily good. For the "Printing for Commerce" judges' report, Frank Davies, Pierre Garneau, and Leslie Trevor argue that they did not believe that any of the submissions for 1962 deserved an award for extraordinary design. They found the submitted commercial annual reports to be "glamorous and deadly dull," that few of the press advertisements were acceptable, but they did find a number of the letterhead designs to be somewhat exciting. However, they despaired that in many cases the "mathematical-formula school of typography" (by which they mean the international style) was being widely used, and that, while organized and rational, was a dead-end path which would lead to blandness and sterility. 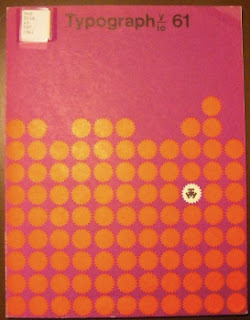 Furthermore, this approach led many designers to concentrate more upon creating regular patterns than legible designs. In particular, the attack the overuse of sans-serif type, which they claim has low legibility. They conclude by stating that 1962 was, "a year of good but not exciting work with gimmicks, bandwagons, and the cult of Me-too-ism well to the fore." The judges' report for the "Newspapers and Magazines" section is written by Keith Scott and, as in previous years, despairs at the lack of quality design in most of the country's serial publications. The one area of exciting new design appears to have been in the Montreal newspapers, with Le Nouveau Journal and La Presse offering thoughtful and well balanced layout which contrasted with the rushed and mismatched appearance of the papers from the rest of the country. In the introduction to the "Experimental Design" section Gerry Moses reiterates Brattinga claim that experimentation is necessary to ensure the production of new an innovative approaches to design. Like Brattinga, he warns that without experimentation there is a danger that designers may tend to rely upon imitation of successful solutions to design problems. He argues that the award wining experimental designs included in Typography 62 can be seen as evidence of how Canadian designers are attempting to avoid charges of imitation. Similarly, in the introduction to the "Student Category" section, Harold Kurschenska argues that the 1962 student submission showed a definite increase in both the standards of the work being produced by Canada's design students, as well in the level of design innovative being produced by Canada's design programs. However, he also calls for the development of more programs across Canada, and especially for programs which teach, the history of typographic design and its sound practices without encouraging pure imitation of those traditional approaches. In addition, he concludes by suggesting the creation of international student design exhibitions, so as to further stimulate international professional interaction the exchange of ideas. The 1962 catalogue ends with a statement from the TDC, stating that when it was established the organization had three major aims: “to build up a professional status by accepting professional responsibilities”; “to encourage printers, publishers, and others to help [designers] in their efforts towards higher standards in printed communication”; and “to increase public awareness which we all derive from good design and craftsmanship.” In claiming that great advances had been made in achieving each of these three goals, the unidentified author emphasizes not only that most of the leading Canadians who identify themselves as typographic designers were members of the TDC by 1962, but also that both the public and the printing and publishing industries had increasingly come to recognize typographic design as a distinct profession. Unlike its predecessors, Typography 64 showcases Canadian design work for more than a single year, including works created and submitted between June 1962 and June 1964. Like several of the earlier catalogues, in addition to showing the winners of the TDC's design competition, the catalogue also contains a number of written contributions by various Canadian designers. It begins with a forward by an unidentified author who highlights the book Love and Joy about Letters by Ben Shahn, praising both its design and the author/designer's views about the importance of good typographic design to the creation of quality publications. Significantly, the author agrees with Shahn that typographic design is, "an expressionistic art notwithstanding the rules, the precision, the perfection that accompany it." 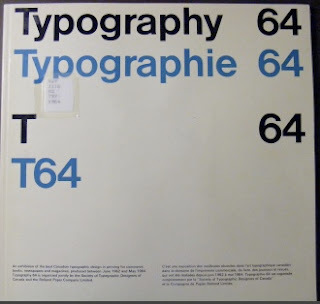 Thus, unlike statements made in earlier editions of Typography by such well known Canadian designers as Allan Fleming, Typography 64 begins with the assertion that typographic design is indeed an art and not simply a trade or a craft. The forward is followed by "An Appreciation" by Allan Fleming. 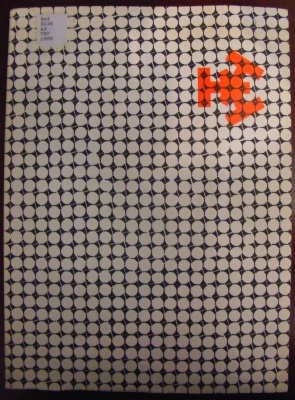 While the cover of the catalogue features the deconstruction of the exhibition's title in Helvetica, and many of the award winning designs of the competition are of the International style of design, Fleming dedicates much of his "Appreciation" to bemoaning the strong and growing influence of Swiss design on the field of Canadian typographic design. He begins by claiming that the bothersome influence of the International style was very apparent to him even before he began his review of all of the contributions to the exhibition, and that, having examined each of the submitted works, he can claim that, "there is no doubt that this is what the designers call a 'Swiss Show.' And as such it is an extremely fine example - full of well oiled, highly professional and quite safely anonymous designs." 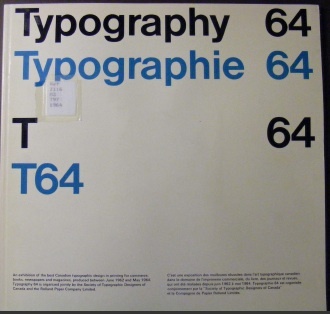 Fleming does argue that the professionalization and number of quality contributions to Typography 64 shows that the field of Canadian graphic design had grown and matured since the establishment of the Typography exhibitions in 1958. He also notes that the Swiss inspired designs of contributors such as Ernst Roch, Rolf Harder, and Gerhard Doerriés had made valuable contributions to the field, but he worries that the influence of the International style was becoming too great and that it would lead to a large amount of homogenous, formulaic, and "safe" work which only offers one approach to design. Referencing Anatol Rapoport, the director of the School of Mental Health at the University of Michigan, Fleming argues that the creation of a single world culture, or a truly international style of design, implies the loss of the diversity and creativity offered by multiple regional or local cultures. Furthermore, while creating a homogenous and safe society, a single world culture would be slow to adapt to challenges, and would not be likely to experiment with new approaches to dealing with problems. While Fleming admits that Canadian typographic design had undergone great developments since the 1950s, he hopes that those developments would not stall with the popularity Swiss typography, stating that the design community should "hope that soon we'll be a long way from the grid system and sans-only approaches." Fleming concludes his written contribution with a number of disconnected comments about various contributions to the exhibition, none of which refer to his earlier attack against the popularity of the International style. The introduction to the exhibition's "Printing for Commerce" section is written by the judges Rolf Harder, Martin Krampen, Tancrède Marsil, and Brian Patterson. The four designers argue that, while of good quality, many of the contributions to the commerce competition were uninspiring. Significantly, like Fleming, they argue that too many of the designs relied upon the sans-serif and grid-oriented approaches of the International style, resulting in professional-looking, but somewhat formulaic, designs. However, they also note that this overreliance upon the International style is often preferable to design which does not follow a formula, but has a bad layout and a poor selection of fonts. In particular, the judges praise Canadian designers for not returning to the modern "Baroque" approach which had been popular in the 1950s, and which they claim was being readopted by many American designers. They believed that the best designs of the competition were, indeed, in the style of the New Typography, but they argued that in the future, Canadian designers should strive to bridge the gap between the formalism and professional approach of the International style and empirical findings as to the most readable and legible approaches to design. This, they argue, would result in designs which communicate particular messages as successfully as possible. The "Book Design" section, judged by John Gibson, Robert Reid, and Arnold Rockman, begins with an introduction in which the judges complain about the lack on innovation in Canadian book design. Significantly, they note that the greatest innovations for 1963 and 1964 were in book case design, with the best work being produced, not in Toronto, the home of Canada's publishing industry, but Montreal. However, they also despaired that many of Canada's foremost book designers were not offering any new solutions to book design problems, but were simply reproducing new versions of older approaches. In addition, like the comments concerning the book design section of previous competitions, the judges also complained that many book designs in the competition suffered from poor binding, poor printing, and poor quality paper. They stress that all of those non-design elements are essential to the production of quality books, and that several of the books that were considered for Typography 64 were judged harshly if those non-design elements were wanting. For the "Magazines and Newspapers" design section, the judges George Beaupré, Paul Fiala, and Chris Yaneff argue that, as with previous TDC competitions, the examples of Canadian newspaper and magazine design submitted to Typography 64 were largely of poor quality. Not only were they wanting in "inventiveness, overall design, typographic detailing, and general handling," but also the number of submissions was also relatively small. They argue that the low number of entries was particularly disappointing given that they had seen good examples of Canadian newspaper and magazine design during 1963 and 1964 which were not entered into the competition. However, those few designs for which the judges reserved praise included Ken Rodmell's cover design of the Imperial Oil Review, work for the Star Weekly by Gene Aliman, a nuclear disarmament newspaper called Sanity by the Montreal designer Peter Matthews, and Gilles Robert's overall design for La Presse. The "Experimental Typography" section was judged by Arnold Rockman and Chris Yaneff, who, like the section judges of Typography 62, begin their introduction to the section by stressing that, contrary to the view of many of the designers who submitted material to the competition, work which was rejected by clients should not be automatically categorized as being "experimental." They were discouraged by the number of submissions that were obviously layout that the submitters had submitted to clients, and which had been rejected by those members of the commercial world. Feeling slighted, and believing that their work should have been embraced by their clients, the judges charge that the designers in question appeared to have decided that their work had been too radical for their clients, and thus, constituted experimental design. However, the judges point out that many such designs were likely rejected by clients because they were indeed bad designs. Furthermore, in addition to rejecting a number of submissions for simply being examples of typographic pattern-making and not experimentation, the judges do claim that the competition had attracted a lot of good experimental design. In particular they praise the Anglo-Swiss inspired slide presentation designs of Tony Mann, as well as the International Style designs by Gerhard Doerrié, which won the top experimental design prize. The final section, "Student Work, was judged by Arnold Rockman and Chris Yaneff. Offering brief comments, the judges claimed that while of a high caliber, the student submissions for 1963 and 1964 very closely resembled the styles and approaches of the students' instructors. The judges suggest that design instructors would be wise to allow their students more freedom in their experimentation. In addition, the judges particularly praised the quality of the submissions from the Ontario College of Art. However, they also despaired that the majority of the entries only came from Toronto and Montreal, and that Vancouver, often a source for impressive student designs in previous years, was not represented. Typography 64 concludes, like all of its predecessors, with a comment from the President of the TDC. In this edition, unlike earlier versions of the President's message, Gerry Moses does not discuss the importance of highlighting quality typographic design for the development of the profession. Rather, he simply explains that the selection of the "best" design work is a subjective process, but one which is necessary in order to differentiate between obviously poor design and that which is collectively viewed as laudable by experts in the field. Interestingly, unlike in the forward to the catalogue, which may have been written by another person, Moses does not refer to typographic design as an art, but as a craft. Hey there. Thanks for sharing. Writing essays is a common struggle among fellow students. Recently, I have found a website where you can buy essay in Canada. It has helped me tremendously. I hope it will help you too. All the best!